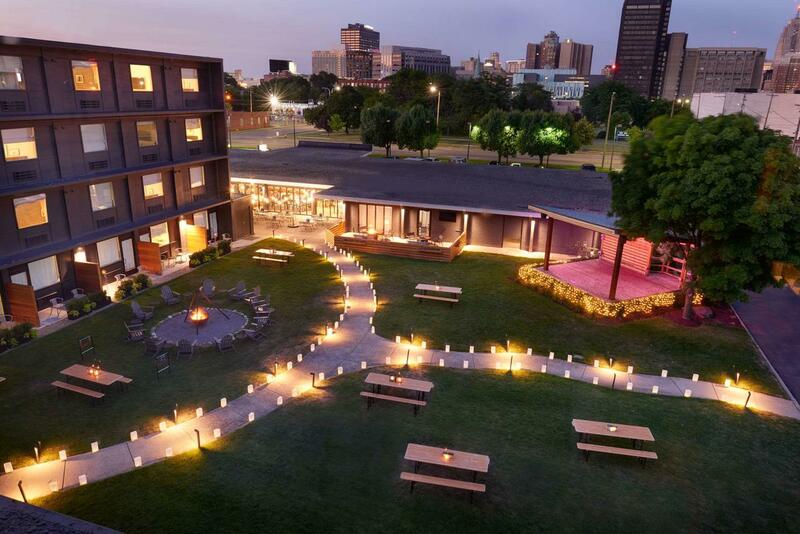 Detroit-based Trumbull & Porter Hotel is a luxury boutique hotel steeped in history. It originally opened as a Holiday Inn in 1966. The hotel eventually shed its Holiday Inn brand flag and became an independent hotel, the locally owned Corktown Inn, remaining so for twenty years. Then, in 2014, it was bought by the current ownership group which sought to revitalize the hotel as an artisan boutique hotel. It rebuilt the hotel and almost all of the work and supplies for the $13 million project were sourced in Michigan, including contractors, artists, designers, staff, hard and soft goods suppliers, and more. The hallmark feature of the hotel is that it displays artwork from more than 50 different local artists, both large exterior murals and smaller interior installations. The artwork takes up more than 4,000-square-feet of space in and around the hotel. Here, locals and tourists come together to experience Detroit and immerse themselves in an art-loving culture. With so much to offer to locals and tourists alike, General Manager Nick Knight wanted to be able to market his hotel effectively and increase TRevPAR. In particular, he wanted to grow revenue by using a digital marketing campaign to drive traffic to the hotel’s various on-site outlets in addition to boosting direct bookings. However, Trumbull & Porter deals with some technology restrictions as a franchisee that limits Knight’s marketing effectiveness. “Since the property belongs to the Ascend Hotel Collection, Choice Hotels does not give me the ability to export emails through their PMS,” Knight says. Additionally, industry standards prevent OTAs from releasing guest email data and the hotel itself had limited ability to capture demographic data. Knight began to look for a way around this technology hurdle and decided to use a branded WiFi splash page that would be able to capture both Facebook and guest email data. After vetting many companies, Knight ultimately decided to partner with Zoottle, a GDPR compliant customer engagement and retention software company. After installation, Zoottle asks guests to give their email address or connect through their Facebook account before accessing the hotel WiFi. It can then capture this information to set up announcements and coupons, boosting the average revenue per guests. The platform also comes with a real-time guest satisfaction survey, allowing hotels to know about dissatisfied guests in real time while boosting positive online reputation and limiting negative reviews. After implementing Zoottle’s solution for 30 days, Trumbull & Porter saw significant results. The industry average email capture rate for hospitality is <10%. Due to current PMS constraints Trumbull and Porter had zero actionable emails. Within a 30-day time span the Zoottle platform captured enough email data for the marketing team to create an actionable list of more than 1000 unique emails. This constitutes a +1000% increase in usable data. Furthermore, the industry average for marketing CTR (click through rate) is 2%, but with the Zoottle platform Trumbull & Porter achieved an average marketing CTR of 7%, or 3.5x the industry average. The lowest of the CTR marketing initiatives by Trumbull & Porter is 2.35% which still exceeds industry average. Meanwhile, the largest CTR Tumbull & Porter achieved was 11.43%. One reason for the high click through rate is that Zoottle compares quantitative and qualitative data to create extremely customized promotions. For example: A man and woman will see a different promotion. A woman over 55 years old and a woman under 35 years old will see different promotions. A woman over 55 visiting for the first time will see a different promotion than a woman over 55 visiting for the third time, etc. The system has 15 quantitative and qualitative variables that can be toggled on or off including gender, age, country, birthday, number of visits, repeat guest, what call to action to execute, etc. which results in millions of potential configurations. This allows general managers such as Knight to view when his outlets are being underutilized and can then “turn on” a promo to remedy that.